Newly promoted Chichester have found things tough in division one of the National Youth Development League so far this season and were not helped by having to field an under-strength team in their latest fixture at Horsham. 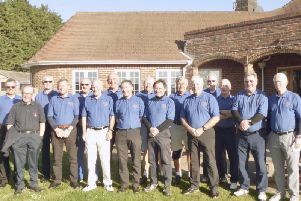 With many of last year’s division-two champions having moved up into the higher age bracket this season, it was left to a largely inexperienced squad of 30 athletes to fly the flag for the club. Two of the talented under-15s made their mark and repeated the fine performances of the previous fixture in April. Newly crowned under-15 Sussex discus champion Oliver Beach repeated his feat of the previous weekend with a winning throw of 33.65m, a new personal best and a distance which ranks him 15th in the UK. Beach had earlier thrown ten metres-plus again in the shot and showed his versatility by just being edged into second place in the 300m with a time of 40.6 seconds. This was probably Chichester’s least experienced all-round under-13 squad for a number of seasons but the ten athletes in action all played their part. In the girls’ squad Millie Grant took the honours with three well-deserved second places. In all three – shot, discus and hammer – the Chichester athlete was fighting for top spot but had to be content with runners-up spots on all three occasions. There was some good sprinting from Fleur Hollyer in the 100m and 200m with able support from Georgia Colston and Sophie Dudman. There was great strength in depth in the middle-distance races with Nicole Boltwood and Cerys Dickinson in action in the 800m, including a 2.26 new best time for Dickinson, while Nina Moranne and Tamsin Anelay put in solid runs over 1,500m. Emily Weymouth and Imogen Hillman joined forces for the high jump while Skye Sadler was rewarded with another impressive pole vault at nearly two metres. Dudman ran well in a very competitive hurdles while Hannah Carmichael joined Weymouth and Maisie Sadler in the non-scoring 800m. For the boys, the most experienced quartet were the middle-distance runners with Joe McLarnon and Archie Sadler producing consistent runs over 1,500m while Gabryel White was joined by newcomer Findlay Taylor in the 800m with Bradley Holder a good reserve. Will Simmons led the sprints while Archie Sadler reached 2.20 in the pole vault and the whole of the seven-athlete squad showed great team spirit in helping Beach in the throws and notched valuable points elsewhere in the track and field. Fionn O’Murchu and Josh Dunne formed the strongest pairing of the day in the boys’ 800m with both athletes recording sub 2.30 clockings. In the 1,500m Hal Edgar and Barney McLarnon formed another good partnership while Dunne was joined by Arthur Dearlove in the long jump with both athletes just under four metres. With Dearlove heading the 100m sprint and O’Murchu showing his talent in shot put and javelin, the rest of the squad supported well. For the girls, Gabriella Styles led the club’s sprints supported well by Lucy Hollyer and Grace Bishop while Bishop was on more familiar territory in the 1,500m with newcomer Alice Waterworth. Amelia McGurk showed good form over 800m and like the boys’ squad, credit must go to the five girls for scoring points in the remaining field events. The next match in the National YDL League is on Sunday, June 17 in Poole. There was a good showing from a small squad of seven Chichester athletes at the Southern Athletics League match at Poole with a number of personal bests during the course of the day. Jacob Piper has been in good early-season form for the under-17s this season and dipped under 12 seconds with an 11.9 clocking in the 100m. This was followed by a 24.8sec in the 200m with fellow under-17 Cellan Robinson giving good support on each occasion. In the field events Andy Hall again threw well over 30m in the hammer but could not match his 38m effort at Andover in April which puts him just outside the top 100 in the national rankings and 3rd in his over 55 age bracket. Hall was also over nine metres in the shot putt, again using the 7.26kg senior implement, heavier than the one used for his age group in masters competition. Lending good support in the field were Robinson in the javelin and Piper with a 5 metres plus effort in the long jump. In the women’s section, Jess Rayner was delighted to break through the ten-metre barrier for the first time with a best of 11.18m, a distance which puts her just outside the UK top 50 in her age group. Making Chichester strongest pairing of the day, Florence Smith was well over nine metres as the club’s B string. The pair combined in the high jump while Rayner opted for a sprint and Smith chose the longer 800m partnering Maggie King. King also honed her sprinting speed in the 20m as well as tackling the 100m hurdles. Returning to competition after a gap of several years was thrower Sharna Russell. Not having great expectations from her first match, Russell was delighted with a second place in the discus and a win in the javelin. The next league fixture in the Southern League is on Saturday, June 23, at Salisbury, where Chichester will be looking to field a considerably fuller squad. One of the most iconic and well-established races on the local scene saw a record field of 481 finishers tackled the challenge of the Trundle Hill race. As part of the West Sussex Fun Run League in recent years, the race has always attracted good numbers but this year more than 100 athletes from other clubs helped to swell the numbers. Another record was notched by the promoting club, Chichester Runners & AC, with 57 finishers, led home, as on many occasions over the past 20 years, by James Baker. The 41-year-old has been in the veteran ranks for over a year but shows no sign of slowing down or losing his consistency. After a charge by the leading athletes from the start at Lavant Village green, the first miles are along the Lavant Valley, then opposite Binderton the course goes sharply uphill on footpaths towards the Trundle. Baker has no equal locally over such terrain. Reaching the highest point of the course with an advantage of just under a minute, the Chichester athlete was never going to be caught but good runs from Andrew McCaskill from Brighton and Tone Zone’s Simon Gill kept Baker’s winning margin to less than 60 seconds. Scoring a maximum ten bonus points for the club in the team standings, Baker was joined by Graham Timson in a fine tenth place with Tom Le Lievre a place behind, with in-form Justin Eggins also notching up a maximum in 28th. These four were matched by a quartet of Chichester’s leading women with Emma Hughes in fifth, Asta Asaka tenth, Kim Nelson 12th and Emma Wickens 14th. Added to a couple of nine-point hauls for the men from Stefano Cerea and David Knight, this gave Chichester 98 out of 100 bonus points in addition to the maximum participation points of 25 for a total of 123 points – winning the match just in front of rivals Worthing Harriers on 121, the other 15 league teams trailing in their wake. Earlier, Josh Dunne had shown the rest a clean pair of heels in the junior one-mile race with fellow club-mates Max Sydenham third, Sam Cato fifth and Digby Fulford eighth. Sixth and seventh in the junior race were twins Lillie and Leila Hellyer, making it a clean sweep in the girls’ race with Grace Emison the third Chichester girl finisher close on their heels in 11th.